Acadian Genealogy Homepage; Indians of Madawaska (#1)! On a scenic knoll not far from Edmundston, New Brunswick on the road to St. Basile, there is a village very different from surrounding villages. It is the Indian reservation of the Madawaska Territory and the remnants of the ancient capital of the St. John River. It is the home of the valiant MALECITE, the most faithful ally Acadia ever had and most feared enemy of the New England pioneer. The early site of this village was exactly where the present city of Edmundston is located. It was then known as Madoueskak. The tribal council hall was just about where the "F.W. Woolworth" Store is today, and the Indian cemetery was located at equal distances between the present Catholic and Protestant churches. Tradition has it, that this Indian establishment existed several centuries before the French exploration of Acadia and Canada. At the time of the foundation of Madawaska by the Acadians, the Indian village numbered about three hundred inhabitants and was the most important center of the MALECITE tribe. The principal MALECITE villages on the St. John River were, Menagoneche (St. John), Aukupag (Springhill, a small village seven miles above Fredericton) and Medoctec, eight miles below Woodstock and Madoueskak at the mouth of the river of the same name. The MALECITES themselves were part of the ABENAKIS Nation and along with the PASSAMAQUODDYS, occupied the whole St. John Valley. The two tribes were formerly known as the ETCHEMINS. The ABENAKIS were part of the ALGONQUIN Nation, one of the more important Indian confederations of Canada. The confederation occupied almost all the Canadian territory, east of the Great Lakes. It extended across New England and Acadia. The MICMACS, who lived in Nova Scotia and Eastern New Brunswick, were also of the ALGONQUIN Nation. The domain of the ABENAKIS, was the valleys of the St. John and the Kennebec rivers. The MICMACS are generally considered the original inhabitants of the St. John Valley. The ABENAKIS of Maine, who were much more numerous, invaded the territory and pushed the MICMACS into eastern New Brunswick and Nova Scotia. The word "Madawaska" itself, is of MICMAC origin. "Madoues" means porcupine and "kak"meaning place...thus, the land of the porcupine. The true aborigines of the valley, then, could very well be the MICMACS. 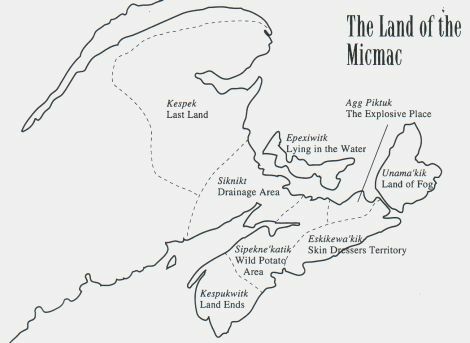 Mi'kmaq Territory consisted of all of Nova Scotia and Prince Edward Edward Island, New Brunswick (North of the Saint John River), the Gaspe of Quebec, and it is surmised by many that it included part of the State of Maine, as well as part of Newfoundland. The MALECITES were, then as now, a nomad people. They fished, hunted deer and moose, but most often they chased MOHAWKS, their foremost enemy. At certain times of the year, the MALECITE's village was almost deserted. They often ate in leisure, what was gathered in a burst of feverish activity, at the price of great privation. Though barbaric in their way of life, they were typical Indians. Equal to Romans in their eloquence, their bravery and valor, they surpassed them in honesty of their morals. In fact, it was extremely rare that the Indians' prisoner would be insulted. They might torture their prisoner, but never treat them indecently! The IROQUOIS reached the St. John Valley through the Etchemins and came on a small MALECITE village at the mouth of the Allagash, and destroyed it. When they arrived at the village of the Madoueskaks, they found that Pemmyhaouet, the great chief of the MALECITE, had organized the defense of his fort, with the help of about one hundred braves. The ensuing combat became one of the most memorable, recorded in Indian legend. The courageous Pemmyhaouet had died in combat, and his son was also fatally wounded. As the defendants fell under arrows and tomahawks of the assailants, their wives and young girls replaced them. It was only after several days, when the besieged MALECITES ran out of arrows and spears, that they gave up the struggle. The fierce MOHAWKS found, in a corner of the ruined fort, two women who begged for their deliverance, by death. They were Necomah, the wife of the fallen chief, and Malobiannah, his son's fiancee. The chief's son, had just died and the two women had braved the furor of the MOHAWKS, to bury their loved ones. Encouraged by their success, the IROQUOIS warriors resolved to continue their quest to the Lower St. John Valley. Since they did not know the territory, they took the two women captives, to guide them down the river. At nightfall, the bark canoes were tied together and left in the care of Malobiannah. Necomah, the chief's wife, had already died of sorrow. Malobiannah mourned her fallen fiancee, and wept over the calamities that had befallen her nation. But in her heart, she kept the Indian emotion of revenge. She resolved to sacrifice her own life, to avenge her loved ones and at the same time, save her brothers of Aukapug and Medoctec, from the disaster awaiting them. She would lead the flotilla over the falls at what is now known as Grand Falls...my home town! At some distance from the chasm, the warriors who had fallen asleep, were awakened by the noise of the falls. They asked their guide what made such thunderous noise. She answered calmly, "it is a new river, the Walloostoock". All the while, the fleet was being drawn towards the abyss. The MOHAWKS, reassured by the composure of the young MALECITE girl, went back to sleep. They were only a few hundred feet from the falls, when they felt themselves caught in the treacherous current and realized their danger. They jumped from their canoes, but it was too late. Shouting curses, they disappeared in the foaming cataracts, accompanied by the triumphant shouts of the heroic daughter of the people they had vanquished. The last thing they heard, were the names of her fiancee and the praises of her avenged nation. The MOHAWKS however, did not delay in seeking revenge for the loss of their warriors. Tradition has it, that a few years later a larger band of IROQUOIS came and ordered the chief of Madoueskaks to..."surrender the fort before sundown". The chief was indignant at this insult. He answered, "go tell your evil master, to show himself on my fields. I am ready to defend them from the aggressors, the crooked noses, even though they may be as numerous as the sands of the Walloostoock, or the leaves of the forest. Go!" The Indians of Madawaska attributed their many defeats to the evil spirit. According to one of their legends, an enormous beaver, a monster of colossal proportion possessed by an evil spirit - none other than Glouscap - had predicted numerous misfortunes. Outraged by the Malecites' infidelities, Glouscap, after having ravaged the lower valley, had come back to Madawaska announcing to the inhabitants, that their fort would be destroyed and the MALECITE would see many long moons of misfortune. Seized with terror, the Indians of Fort Madoueskak, tried to appease the vengeful spirit. They gathered the best beaver skins and placed them at the mouth of the river. A seer who lived on the banks of the river, came to tell them that Glouscap had looked with favor on their offering and the MALECITE would see happier days. Very pleased with the sacrifice, the spirit wanted to show his satisfaction. Seeing that a small stream flowed at the far edge of their encampment, he changed its course, to make it flow nearer to their dwelling. However, a huge cliff formed a fall in the bed of the new waterway, so, with one sweep of its mighty tail, he brushed away part of the rock, to permit canoes to pass through. He then went back up the river, to spend the winter in Lake Temiscouata. The following spring he returned to the land of the setting sun from whence, according to legend, he shall return to punish any MALECITE who does not remain faithful to the Great Spirit, who dwells in the land of the rising sun. These legends are carefully preserved by the Indians of the Edmundston reservation. They are displeased when their audience shows disbelief and are angry with those who might laugh at a legend relating to the Indians' ancestors. The discovery of axes and stone spears in Edmundston in 1925 or so, confirms the presence of Indians in the region, in a far distant past. According to archaeologists, these primitive weapons date back to three or four hundred years before the era of discovery of the territory. However, the first recorded data that we have on the Indians of Madawaska, are the notes of Bishop Saint-Vallier, second Bishop of Quebec. These notes were made during his visit to Acadia in 1686, one hundred years before the first settlement in the valley. The following is from "The State of the Church and the French Colony in New France" (L'État de l'Église et de la colonie française dans la Nouvelle-France), published in Quebec, in 1856. "On the second day of our journey on the St. John River, on May 16, 1686, we saw a hut belonging to Christian Indians of Siller, who in order to go hunting, had stationed themselves at the mouth of the river that they call Madoueskak and that we renamed St. Francis de Sales." (Note: On D'Anville's map, the Madawaska River is called the Great St. Francis, while the present St. Francis River is called the Little St. Francis). "Words cannot describe the joy of these poor Christians at seeing us, nor ours in finding them. They offered us a gift of part of their food, at a time when ours was running out. The next day, we found more of them in three other huts and they received us in the same manner and begged us for a missionary, to instruct them. A few of them came from Isle Percee and we were surprised to find one who spoke a bit of French and had been to France." These Indians had known civilization. There seems to be no doubt the "Black Robes" (Priests) had spent some time in Fort Madoueskak, before the expedition of Bishop Saint-Vallier. We believe the first English publication to mention Madawaska, is a leaflet entitled "Memoires of Odd Adventures in the Captivity of John Gyles" published in Boston in 1735. In his interesting narrative, Gyles tells of having seen several huts at the mouth of the tributaries of the St. John River. In 1692, a French explorer, Lamothe Cadillac, founder of the city of Detroit, navigated up the St. John River. He reports that "at forty leagues above Fort Medoctec, there is another fort to which natives retreat, when they fear some calamity". William de Rosier's map of the Abenakis missions of the St. John Valley (1699), indicates that at the same time there were nine Indian settlements in the area; three on the Aroostook River, four on the St. John River, one on Eagle Lake and one on the Squateck Lake. One St. John Settlement was at the mouth of the St. Francis River (Madawaska). A later map of the Madawaska Valley, dated 1787, by George Sproule, Surveyor-General of New Brunswick, informs us that there was, at the time, on the southeast bank of the Madawaska River, an Indian village of about sixty families, which was the capital of the MALECITES. Sproule reports: "It is here that the Great Council Hall is located. These Indians are visited by priests from Canada". Re-print from "The History of Madawaska" with copyright permission from the Madawaska Historical Society.